Two films have recently been released that are fairly similar: the Coen brothers' True Grit and Gore Verbinski's Rango. Both are set in the Old West and feature the same themes of retribution and proving oneself. However, Grit features an Oscar-winning cast with names like Jeff Bridges, Matt Damon and Josh Brolin. Rango revolves around a chameleon teaming with a gecko to fight off a turtle and snake. Despite this, I believe both can be compared when it comes to the quality that the films possess. True Grit, a remake of the 1951 Western of the same name, begins when outlaw Tom Chaney (Brolin) guns down the father of Mattie Ross (Hailee Steinfeld) and steals his possessions and horses. Maddie decides to pursue Chaney with the help of hired US Marshall Cogburn (Bridges), and Texas Ranger LeBoeuf (Damon), who also seeks Chaney for personal reasons. Along the way to bringing Chaney to justice, they each learn that the others have the 'true grit' necessary to each get what they want. Despite Jeff Bridge's scene-chewing performance as the cycloptic US Marshall Rooster Cogburn (originally played by Uber-Cowboy John Wayne), True Grit is a character ensemble film, with Matt Damon and Hailee Steinfeld being equally important and impressive as Bridges. Steinfeld deserves mentioning especially, due to her incredibly impressive debut, delivering the Coen's fast-paced dialogue with the confidence of an actor 20 years her senior and she genuinely seems to be enjoying herself doing it. Matt Damon also deserves praise for his performance, as I was honestly surprised at how well he suited the role of the cocky and arrogant LeBoeuf, as well as the Western setting. However Bridges, as always, steals the show with a stellar performance worthy of a Best Actor nomination, with his drunken slurring and violent nature feeling very realistic and making you forget he ever starred as the free-living pacifist “The Dude” in the Coen's epic The Big Lebowski. The only problem I had was the underused Josh Brolin. The main plot revolves around the three characters searching for this elusive, crafty and murderous 'Tom Chaney'. But when they discover him, he only appears on screen for the last fifteen minutes or so, and after Brolin's performance in the Coen's No Country For Old Men, he was one of the main reasons I wanted to see this film. A talent such of his should have had a bigger role for certain, but what he had to deal with, he handled expertly as usual. True Grit marks the Coens' first real attempt at a 'genre' film, instead of making a film in that certain 'Coen Brothers' way. Whilst Westerns have certain aspects that need adhering to, such as gunfights, the double-crossing and the authentic dialogue, the Coens handle it incredibly well as well as adding their own style to things, such as Rooster's dry humour and a situation involving a man in a bearskin. The Coens make sure that everything looks sublime, with BAFTA-winning cinematography from Roger Deakins, as well as the costume and music. I am certain I will be labelling this one of my films of the year come December. 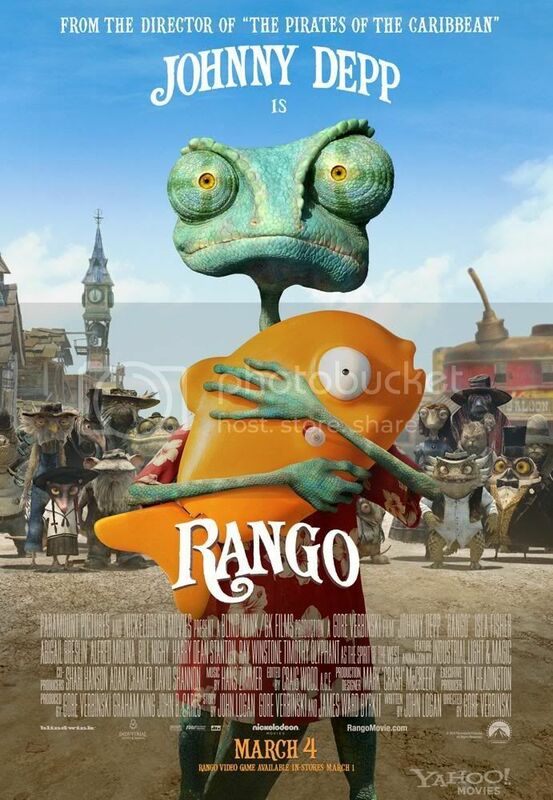 It is possible that Rango will be up there too. High praise indeed for an animation that isn't made by Pixar or Dreamworks, but Gore Verbinski's Rango isn't really aimed at the same audience, which is quite refreshing. Verbinski did it for a change of pace from the Pirates of the Caribbean franchise, and that is exactly what it is. Rango tells the tale of a chameleon who ends up lost in the Mojave Desert. When he happens upon the town of Dirt and it's inhabitants, the chameleon takes on the persona of 'Rango', a tough gunslinger. The townpeople are thoroughly impressed by 'Rango' and make him their Sheriff, and put him in charge of finding out what is happening to their ever-diminishing water source, as well as defending their town from Rattlesnake Jake. Now the storyline isn't really going to enthral the little 'uns and it might go a little over their heads. Some of my colleagues walked out of the film due to 'being bored', so it isn't for everyone. I got the feeling that it was mainly aimed at film fans, as the film features many references to Westerns of the past, such as Rango speaking to a Clint Eastwood figure, as well as nods to other films, such as Rango landing on the car windshield of Raoul Duke, a character Depp played in Fear and Loathing in Las Vegas. The animal characters are quite grotesque, and look truly anthropomorphsised. The script is quite witty and sharp, with Johnny Depp doing a great job as usual as the titular chameleon. It might be a little complicated but it is fresh and original and I sincerely hope for more in the future. With both True Grit and Rango making a decent impression on the box office figures, and with the upcoming Cowboys and Aliens, it looks like Westerns may be coming back from the dead. I just hope that Jeff Bridges stars in ALL of them. Sorry, make that ALL films. Eye-patch: optional.